Blue jays are intelligent, aggressive, noisy, and playful birds. They can mimic the call of predators or sound a warning call to alert other birds of danger within its territory. These birds are famous for the blue plumage on their wings and tails. While male and female blue jays are almost identical, one can tell them apart by observing them in their habitat. A male blue jay usually measures 30 centimeters (11.8 inches) long and is often larger than a female blue jay, but other than that, they are similar in physical appearance. Blue jays have a white face with a familiar blue crest on its head that rises up or down depending on the bird’s mood. The crest is fully upright when the blue jay is excited or in an aggressive state. It points forward when the bird is surprised and bristles outward like a bottle brush when it is scared. When it is feeding with other blue jays, or resting, the crest lies flat on its head. The male blue jay’s mating and social behavior is what sets it apart from the females. Courting season begins in February, and groups of 3 to 10 blue jays can be observed at any given time. The male’s behavior is dictated by the female. If the female flies off, the males will follow until the female lands. As soon as the group lands, the males will bob their heads up and down while fluffing their feathers to attract the female. Male and female blue jays often help each other build the initial nests, but the male’s main role is to hunt for food and bring it to the female. Female blue jays are usually smaller than male blue jays, but is physically similar. However, subtle differences can be observed during their courtship and mating ritual. The female can be seen “leading” a group of male blue jays during courtship. She can be seen walking about, choosing her mate from a group of males rustling their feathers and bobbing their heads. Once she has chosen a suitable mate, they build a “test” nest together, but the female will eventually finish the “final” nest herself. She will incubate their eggs and wait for her mate to bring food. So what’s the difference between male and female blue jays? While a male is usually bigger than a female blue jay, both are identical when it comes to other physical attributes. However, a male can be distinguished from a female when closely observed during their courting and mating rituals. As part of their courting ritual, a group of male blue jays follow a female blue jay. The female then observes as the males bristle their feathers to win her attention. 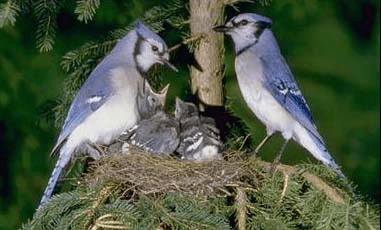 Even though both male and female blue jays build a series of “test” nests together, the female has the final say and builds the actual nest on her own. Once the female lays the egg, she incubates them while the male hunts for food to bring his mate.